Former Ridgefield resident and teacher Christine Wilson has a message for parents who may have Down syndrome child: There is hope, and there can be lots of laughter and love. 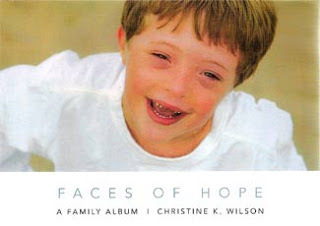 Ms. Wilson is the author of a book on Down syndrome, Faces of Hope — A Family Album, which was released earlier this year. Its aim is to both educate and inspire parents and other family members of children affected by Down syndrome. The book is designed in the style of a photo album, each page displaying a black-and-white picture of a child with Down syndrome accompanied by a heart-felt quote by a close family member. Down syndrome occurs when a person has three, rather than two copies of the 21st chromosome, Mrs. Wilson, adding that one in every 691 babies is born with the syndrome. Right now, there are more than 400,000 people with Down syndrome living in the United States. Mrs. Wilson, a parent of a child with Down syndrome, has dedicated herself not just through her book, but also personally helping to comfort and guide new parents of a child with Down syndrome. The idea for her book was sparked by a phone call from a social worker at Danbury Hospital who knew that she had a son born with Down syndrome, and asked if she wouldn’t mind talking to a couple who had just been notified their child was born with the same condition. Mrs. Wilson was more than happy to help. “The end result would be a book that could be shared by anyone touched by a child with Down syndrome — a simple offering to help dispel worry and bring hope during times of uncertainty,” said Mrs. Wilson. Christine Wilson lived for many years in Ridgefield where her husband, Chip Wilson, grew up and graduated from Ridgefield High School in 1975. The couple has three children. Mrs. Wilson worked as a special education teacher at both Ridgebury and Barlow Mountain Schools. “Because of my experience, as a special education teacher and parent of a special needs child, I have been able to build a special trust and bond with other parents of children with Down syndrome,” Mrs. Wilson said. Faces of Hope is available at Books on the Common.